GATE has set out to create unprecedented security for e-wallet users around the globe. With innovative and patented technology, GATE enables seamless transactions to be accepted anywhere credit cards are used without the need for merchant integration. Previously known as TokenID, our client approached us to complete a brand overhaul and renaming. We had a unique opportunity to introduce a revolutionary, game-changing technology. GATE stands for Global Acceptance Transaction Engine. The solution opens up a “gate” of revolutionary advances in technology, while creating a new language around this uncharted technology. The name encourages users to spark conversation around an entirely new name in this space. We were tasked with refining our client’s brand, and choosing a name that reflected the global capabilities of their technology. It was essential that TokenID's new name fully encompassed their range of capabilities. From that, GATE was born. When rebranding GATE, we kept certain keywords such as “global” and “transactional” at the forefront of our process. Our color scheme was hues of blue, because it is representative of digital currency, technology and web-based transactions. We picked a geometric sans-serif typeface for GATE. The monolinear aesthetic of the Poppins font lended itself perfectly to the reliability that GATE strived to convey, and paired well with the graphic style that we chose. In truly capturing the information hierarchy of the website, we opted for all different weights of the font. The logo forms a 'G' and signifies secure connectivity, while its colors represent digital currency and resonate within the technical community. We applied isometric illustrations, built on a 45 degree angle. Creating multidimensional, moveable illustrations — our designs show that each piece exists on a different plane — symbolizing the moving parts of this seamless technology. Brands within the financial and security industries can often overwhelm users with very technical content. In breaking down GATE’s mission and objectives, we balanced the complexities of the industry with digestible imagery, focusing on concise copy paired with engaging illustrations. Our teams anticipate exceptional growth as GATE continues to expand on a global scale. We built out a lean, yet informational website for GATE. The site has a live ticker that populates with the most current mobile and digital payments information, animated graphics and categorized financial services to best suit readers. We added an informational video on how GATE works, integrated Calendly and built out a career form for potential employees. 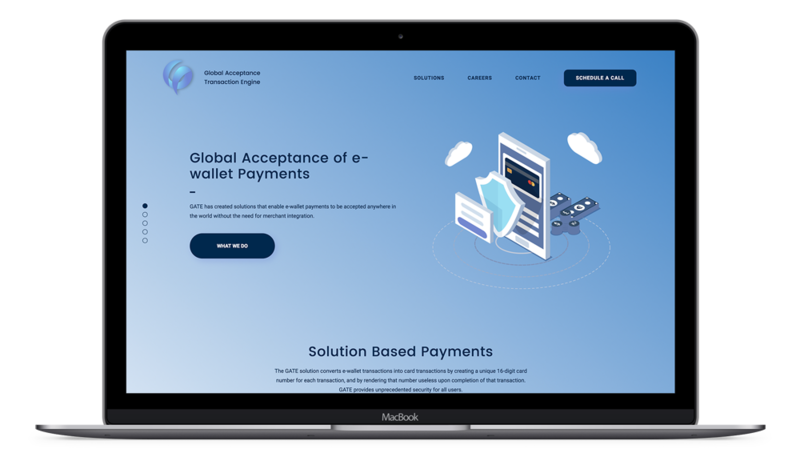 What began as TokenID has transformed into a revolutionary global acceptance transaction application. We are thrilled to be able to rebrand and position GATE as the tremendous force that it is in the Fintech industry. Engaged with banks all over the world, we look forward to supporting GATE’s scalability as global banks, financial institutions and eWallets are onboarded.